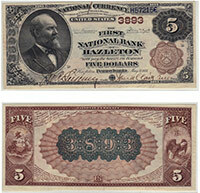 It is not uncommon for a $10 brown back to represent the earliest and rarest currency issued by a national bank. There really are no tricks to determine the value of a national bank note like this. The exact value is really just based on a number of factors. The two most important variables are the condition and bank of issue. Please contact us for exact value information. Don't forget to check the serial number. Number 1 notes always sell for nice premiums.